For twenty years now leadership has dominated programmes, books and training departments. However, we seem to be witnessing fewer inspirational examples of good leadership, and instead are faced with corruption and misbehaviour from our so-called leaders. The recent actions of bankers, sports bodies, corporate directors and politicians, have all made the concept of moral, transformative, and authentic leadership seem a thing of the past. 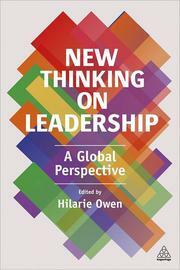 New Thinking on Leadership brings together the latest thinking from around the world to empower practitioners and academics to turn around what has been called 'the leadership crisis'. With new, and sometimes controversial, insights from both leading academics and pioneers in the corporate world, it provides readers with the latest global picture of where our understanding of leadership is, and where it could go if we get to grips with the issues facing leaders today.